Stories are one way to better understand a place. From the plains to the peaks, the Castle region is full of stories. Both new and old stories have been shared by visitors and people who have called the Castle home for generations. One storyteller is Robert Kershaw, the author of the 2008 book Exploring The Castle: Discovering the Backbone of the World in Southern Alberta. The book is one-half guidebook, with all the information for visitors to understand and safely explore the Castle. The other half is a comprehensive narration of the natural and human history of the region. Robert is a storyteller that shares the insight of local residents and writers from around the world. He used the book as an opportunity to expand awareness of the natural and historical beauty of the region, and as a result transformed the story of his own life. “I was interested in stories and trying to find communities,” said Robert, who worked in the oil patch and studied communications and ecology at the University of Calgary before moving to southern Alberta. Throughout his career, Robert used a variety of mediums to share the perspectives of individuals who appreciate the Castle region. He co-owned the Waterton-Glacier Views newspaper, a venture that got him “locked into the community.” For three years, Robert talked to community members throughout southern Alberta and northern Montana – the regions within and surrounding the Waterton-Glacier International Peace Park. Another project was a recreational trail map for southwestern Alberta. 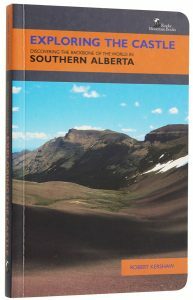 He was then asked to expand the trail map into a guidebook for the Castle region with the support of CPAWs, and Robert began to hike and map the Castle’s trails in 2005. From there, conversations with residents from various backgrounds contributed to the book’s narrative about the natural and human history of the Castle region. Trail and tourist info is complimented with advocacy – readings, quotes and journal entries all added to the chronicle. Robert was a “listening post” for anyone with a “deeper appreciation” of the Castle area. Everyone was welcome to contribute to the story. The goal of the book went beyond tourist information and GPS coordinates. “What [the book] does offer, hopefully, is an invitation to experience a place of remarkable physical, biological, historical and cultural diversity with renews sensitivity and awareness,” reads the book. “It is always about a deeper appreciation,” said Robert, who now lives in California. Just as the book left an impact on visitors and residents of southern Alberta, it left a meaningful mark on Robert. “The book helped give me deeper appreciations for the complexity of the area,” explained Robert. Exploring The Castle was published in 2008. Robert had already moved to California to work as a program director with StoryCenter, an organization that facilitates social change through listening, creating and sharing stories. Now nearly a decade later, the Exploring The Castle is missing a major chapter in the history of the Castle – the status as a provincial park. The book, however, remains a testament of the community appreciation for the Castle. On a recent trip with his family to Alberta, Robert shared connections to places and people that he valued when he called Pincher Creek home. “There is a kind of local appreciation,” he said. Stories have the potential to impact those that hear them and those that share them. That is what happened to Robert, and that is what can happen to all visitors who share the joys of the Castle. That is the potential of a story.